COMMENT (By a soul): The following is a 13-page Guide for preparing for the Great Warning and the Second Coming of Jesus Christ. 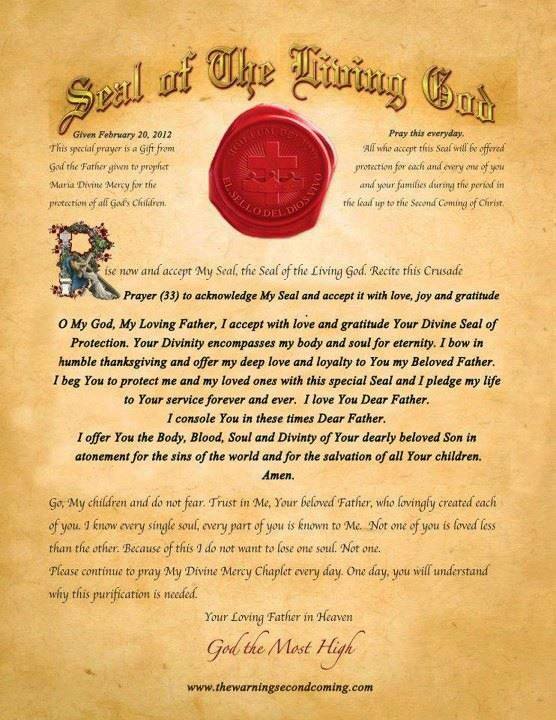 The Guide has been compiled by volunteers using messages from the Book of Truth as given to Maria Divine Mercy. Prayer for Key to Heaven: Dear Father, it is I, Your lost child, who, so confused and blind, that without Your Help, Your Love, I am nothing. Save me through the Love of Your Son, Jesus Christ, and give me the Key to Your New Paradise on Earth. Amen. Prayer for Immediate Pardon: Please guide me towards the Light and Goodness of Your great Mercy and forgive me for my sins. What is the Great Warning ? The Warning is a form of Global Confession. It will be the time when everyone will be expected to ask for the forgiveness of their sins, or face rejection. The two stars will collide and many will be fearful. There is nothing to fear because this is the greatest gift I bring so that not one soul is lost to the fires of Hell. Then, My Cross, will appear in the skies and not one person will fail to notice. Many will fall down in fear and a great shaking, like an earthquake, will be felt. Then will come the silence. The skies will be peeled back as if a roof has opened to reveal the fires and the flames of My Divine Mercy. The earth will be shaken with such force that no man will escape My Eyes, My Spirit or My Gift, Many will tremble with fear because it will only be then that many will become aware of their souls for the very first time. Every single one of My children will be shown their lives, their sins, their wrong doings and every single insult they were responsible for against their brothers and sisters, all during a mystical experience. Not one man, woman or child on this Earth will be excluded. It is important to understand that The Warning is just that. I come to warn God’s children that their sins can and will be forgiven. I come to show them what the Day of Judgement will be like. This will mean that those who ask for redemption at this stage will be saved. You will see your sins and understand immediately how they appear to Me. Instantly, you will understand clearly how offensive they are and wrong. This is your chance, children, to repent. This is not Judgement Day, but a taste of what it will be like. The Warning will be a purifying experience for all of you. It may be unpleasant in part, especially for those in grave sin. Because for the first time ever, you will be shown what it feels like when the Light of God disappears from your life. Your souls will feel the abandonment felt by those who die in mortal sin, these poor souls who left it too late to ask God to forgive them their sins. Remember, it is important that I allow all of you to feel this emptiness of soul. For only then will you finally understand that without the Light of God in your souls you cease to feel. I smile with joy and happiness when I think of the moment when this great Gift of My Mercy is revealed to My children. It is a homecoming, the likes of which cannot be described. For this will be when your hearts will be filled with My Divine Love. Your souls will be enlightened, finally, in preparation for the New Paradise on Earth. Rejoice when the sky explodes, for you will know that I Am truly coming into the world. At last mankind will not be able to deny Me. My Love will radiate in every corner of the world as I try to draw in all souls everywhere. This cleansing will waken up My children and many more will accept the graces, with gratitude, when they are poured over humanity during The Warning. During The Warning, all those who have redeemed themselves in My Eyes will not suffer the pain of Purgatory. Either way the fires of the purification and suffering will be felt by all sinners. The length of time will depend on the gravity of their sins. Without this Miracle, billions of souls would go to Hell. So then, I must remind you that you must prepare for this Event, for it will cause tremendous pain and suffering for many. It will be as if many have plunged into the lowest level of Purgatory, which purges the soul with a powerful heat and creates a terrible sense of remorse, which causes pain of the flesh. Many souls will rejoice. However, even those souls who are close to Me will also feel anguish when they have to face their wrongdoings before Me. The shame they will feel though will be quickly forgotten, as the Light of My Mercy will devour them and fill them with Graces. The souls who do not know Me at all will be mesmerised and many will believe that they have died and are being judged by Me, on the last Day. They too will rejoice when the Truth is revealed to them. Then those poor wretched souls, who relish their sinful lives, will suffer greatly. Some will break down and lie at My Feet and protect their eyes from My Light, because the pain of standing before Me, alone and defenseless, will be too much for them to bear. They will not ask for My Mercy, for their hatred of Me runs deep. Finally, the souls who have completely renounced Me and given themselves over in body and soul to the evil one will suffer a greater torment, as if they have crawled into the depths of Hell. Many will not be able to withstand My Presence and they will fall stone-dead before Me. Others will try to call out to Me, but they will be dragged away from Me by the evil one. By the miracle of the Illumination of Conscience, He, my Son, will bring joy, love and hope to the world. Open your hearts and let Me guide you to My Paradise, on Earth where you will enjoy eternal life. The Warning will herald the preparation for My Second Coming. What is the Second Coming ? My Second Coming is the fulfilment of a New Covenant. It will be the creation of the perfect Paradise which was lovingly brought to fruition for Adam and Eve by My Beloved Father. The time since My Crucifixion on earth has been painful for humanity because of the reign of Satan who has ruled the earth during this period. The pact with Satan is almost over and two events must soon take place. The redemption of the human race will occur during The Warning. From then onwards people, including those who are ignorant of the existence of God, will embrace the Truth. Others who will respond slowly to this great miracle, when the proof will be presented to them, will convert in time. They too will seek forgiveness for their sinful lives. Then comes the final stage, the sanctification – the final purification so that the whole of humanity is fit to enter the perfect Paradise. This is the Paradise inhabited originally by Adam and Eve. It will only be then the Divine Will of My Father, where all people will love and respect the Will of My Father, is to be accomplished at last. They will see great signs in the skies, before The Warning takes place. Stars will clash with such impact that man will confuse the spectacle they see in the sky as being catastrophic. As these comets infuse, a great red sky will result and the Sign of My Cross will be seen all over the world, by everyone. Many will be frightened. But I say rejoice, for you will see, for the first time in your lives, a truly Divine Sign that represents great news for sinners everywhere. The stars will soon change and the time for the comet to appear, of which I spoke, when people will believe that there are two suns, is close. Soon the wondrous spectacle will be seen by humanity, and there will be heard the sound of thunder, and it will seem that the two suns will collide. Once again the signs will appear first. Many people will sit up and take heed when they see the changes in the skies. They will witness the sun spin like never before. Then they will see the Cross. This will happen immediately before the stars clash in the skies and when My Rays of Divine Mercy will cover the Earth. Silence will ensue so that each soul will be in a state of absolute privacy when they come before Me. Tell My children what to watch out for, because they must not be afraid. This is not an Event to fear. Instead you must all welcome this encounter. The skies will be peeled back as if a roof has opened to reveal the fires and the flames of My Divine Mercy. The earth will be shaken with such force that no man will escape My Eyes, My Spirit or My Gift, Many will tremble with fear because it will only be then that many will become aware of their souls for the very first time. 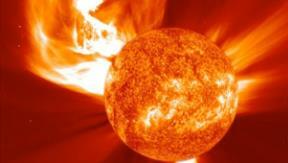 Many will feel a fire burning through their bodies as if the heat of the sun is overpowering them. All will remain still for fifteen minutes, and then life will become like before, as if this miracle did not happen. So unexpected will this event be that the world will stop in great shock. When they slowly recover, many will still be unsure about what has happened. As I come, so too will Satan and the demons from Hell, who will try to devour the souls of My children. In those, whose souls were touched by the Truth, life cannot, nor will it ever be the same again. They will then follow Me, My Teachings and they will convert in billions. My Messages will become their daily food and along with My Most Holy Eucharist, they will need nothing more. So strong will they become that nothing will stand in their way, nothing will intimidate them, or slow them down, as they march in My remnant army towards My New Paradise. Those who pull away from Me need your prayers. They will be given more time to turn back to Me and ask Me to forgive them. But that time could be as short as a day or as long as a few years. After The Warning will come a great desire to give glory to God. This will be a period of great trials; because the enemies of God will do everything possible to convince the world that The Warning – the Illumination of Conscience – did not take place. Those who still reject Me will be given time to repent but not much. If they still forfeit My Hand of Mercy then I will have to withdraw. Then I will divide the just into one side and the unjust into another. One more chance then to seek redemption and those who refuse My Hand of Love and Mercy will be cast into Hell. Once The Warning takes place there will be much confusion. People, everywhere, will be humbled in a way which is out of character. Many will be too distressed to go back to their place of work immediately. People in powerful positions, in governments, will question their laws. Those murderers and criminals amongst your communities will feel a terrible sorrow and despair but many will atone for their sins. My priests and My other sacred servants will immediately know that these messages come from My Divine Lips. Then they will rise and follow My loyal followers to help Me prepare the world for My Second Coming. Some among them will know that it is I who speaks to them but will lack the courage to openly proclaim My most Holy Word. In time they will be given the graces to uphold My Sacraments when they realise that they are to be desecrated. Then they will be given the proof of these prophecies. Many parents will need to instil, in their children over the age of 7 years, the importance of prayer and repentance from then on. Parents, you have a duty to teach your children the Truth. Their hearts will be open to My love after The Warning and you must keep guiding them in spiritual matters. Many will convert. Many will die. Of those who will die their souls can be saved through your prayers. After that the world will calm a little and time will be given to repent. The deceiver, will try to convince them that The Warning was an illusion. Many will spread lies about The Warning after it takes place. They, the heathen, who are slaves to Satan will create a lie, which they will spread everywhere. Scientific arguments will be put forward to explain away the Event. Then, and only then, after The Warning takes place will the world be given a chance to withstand the Great Chastisement, which will follow if sinners do not repent in their multitudes. For then the Hand of My Father will fall everywhere on those who refuse to hear the Truth. A Great Chastisement, the likes of which has not been witnessed since the time of Noah, will be unleashed by God the Eternal Father. Only My Father knows of the dates but I can tell you that it [The Second Coming] will take place not too long after The Warning has occurred. Prepare your souls beforehand for healthy souls will find The Warning a Joyous Event. They will not suffer because they will be in a state of grace, especially if they receive the Sacrament of Confession regularly. Their strength will help those who must go through the pain of Purgatory after The Warning. You may not listen to Me now, as I plead with you to pray for souls who will be lost to Me. But, you will when this is proven to you, after this Great Event. For then I will expect you to follow Me and form the remnants of My Church. It will be then that we will all unite to pick up the pieces left, as we walk towards My New Paradise. Prepare your souls beforehand for healthy souls will find The Warning a Joyous Event. They will not suffer because they will be in a state of grace, especially if they receive the Sacrament of Confession regularly. Prepare your homes with blessed candles and a supply of water and food to last for a couple of weeks. Pray also to St. Michael the Archangel. This is why I must urge you all to sprinkle your home with Holy Water and have blessed candles everywhere. You must keep yourselves protected. For Catholics among you, you must receive the Sacrament of Confession every two weeks if you wish to remain in a state of Grace. In this way your pain, during The Warning, will be mild and you will have the strength to help your brothers and sisters who will suffer a terrible pain and guilt as they try to come to terms with the illumination of their conscience. Your own confession is important and you must try to get this once every week from now on. The aftermath [the Great Warning] will be difficult but you must not be frightened. Instead be relieved, for the suffering is to be offered in thanksgiving for the eternal life. When your sins are revealed you must ask Me to forgive you and bow in humble thanksgiving for this Divine Gift which is your passport to eternal life in the New Paradise on earth. Remember there is not one sin, no matter how serious, which cannot be forgiven once true remorse is shown. Look to each member of your own family, those among your midst, who do not follow My Teachings. Look amongst you for those souls lost to Me, who outwardly reject Me. Then I ask that you pray hard for them at this time. You must beg for Mercy for their souls. Your prayers and sacrifices can save them from a terrible suffering during the Purification at The Warning. By simply accepting that this event may take place, they can survive it. Turn to Me and say: “Please guide me towards the Light and Goodness of Your great Mercy and forgive me for my sins.” and I will pardon you instantly. Then after The Warning you will experience a deep peace and joy in your soul. My children will need to tell as many of their friends and family of this Great Event in order to save their souls. No matter if they smile and ridicule your claims, for afterwards, they will thank you. Tell them the Truth. Ask them to open their minds. They should be made aware of what they will witness, because when they see My Cross in the sky they will be prepared. That is all they need to understand. Then they will accept the discomfort they will endure when their past lives are played out before their eyes. Tell them to review their life and remind them of the harm that they may have inflicted on their fellow brothers and sisters. Let The Warning bring you as one in Me. When you do this and pray for guidance, you will be rewarded with the New Paradise on Earth where you will want for nothing. Rejoice, smile and welcome Me when the Sign appears in the sky. Raise your arms and sing praise to God the Father, for allowing Me this last chance to save you. Pray, give thanks to God the Father, for this Great Warning. Embrace this Gift with love and joy in your hearts. After the Great Warning – Many parents will need to instil, in their children over the age of 7 years, the importance of prayer and repentance from then on. Parents, you have a duty to teach your children the Truth. Their hearts will be open to My love after The Warning and you must keep guiding them in spiritual matters. O my Jesus, keep me strong during this trial of Your Great Mercy. Give me the graces needed to become little in Your Eyes. Open my eyes to the Truth of Your promise of Eternal Salvation. Forgive me my sins and show me Your Love and Hand of Friendship. Embrace me into the arms of the Holy Family, so that we can all become one again. I love You Jesus and promise from this day forth that I will proclaim Your Holy Word without fear in my heart and with purity of soul forever and ever. Amen. Unite all families, Jesus, during The Warning, so that they may receive Eternal Salvation. I pray that all families remain together, in union with You, Jesus, so that they may inherit Your New Paradise on Earth. Amen.